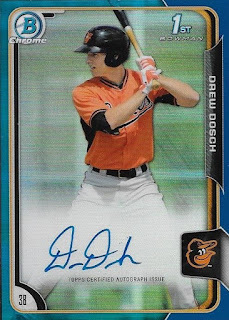 I finally sent off a card to an Orioles minor league affiliate to try to get a TTM success. I figured that since I had 4 of these 2010 Bowman Cole Billingsley cards, I would see if I could get one signed. 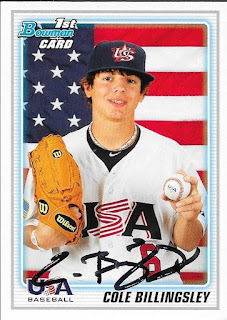 You may remember that I bought a whole stack of the 2010 Bowman Team USA 18U cards out of a dime box at the 2012 National. I was able to sell a few Albert Almoras and Alex Bregmans, but I kept the Cole Billingsleys (and some of the other guys) to see if any of them would some day make the majors. Luckily, Billingsley was drafted by the Orioles this year, and is now playing at Single A Short Season Aberdeen this year. As of last night he is batting .281 with 3 home runs and 15 RBI. He will probably be shut down once Aberdeen's season ends, as I did not see him listed as one of the O's headed to the Arizona Fall League. I mailed to Billingsley on June 30 and got the card back on August 8 for a 39-day TAT. I mailed to Ripken Stadium. As the Orioles crap the bed on this season, now is as good a time as any to look toward the future. While I was at the National, I utilized the bargain boxes to add some O's "prospects" to my collection. 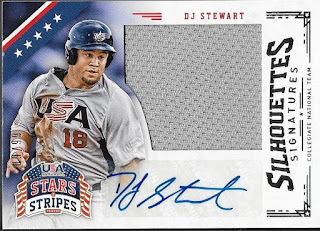 The above DJ Stewart jumbo relic/auto cost me less than $5.00, but is a pretty cool card. Stewart hasn't really lived up to his "first round draft pick" billing, but since his promotion from Low A Delmarva to High A Frederick, Stewart's batting average has picked up by 42 points from .230 to .272. 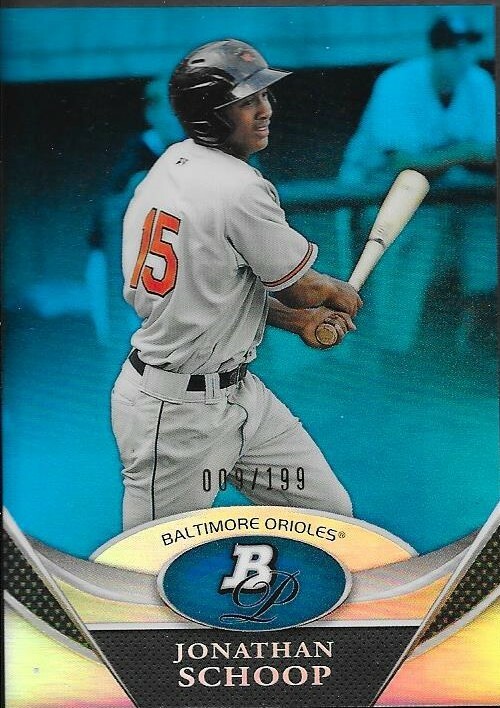 He had 4 homers at Delmarva this year, coupled with another 4 at Frederick. He should develop more power, but that remains to be seen. 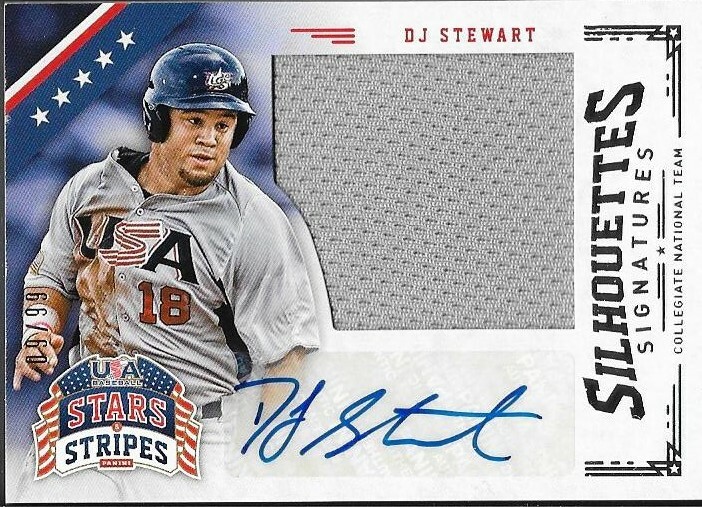 So far, Stewart appears to be far away from reaching the Majors, but one can still hope. The kid is only 22, so hopefully he can continue to improve. This Chance Sisco was a dine box find. Sisco might be the top Orioles prospect, and may see playing time in the majors next year. He is only 22, but holds a .322 career average over 4 minor league seasons. The Orioles desperately need a high average player who can get on base. Compared to the dismal .230 average that Matt Wieters is showing this season, Sisco may be an upgrade over the former phenom. Sisco isn't regarded as a plus defender, but Wieters seems to have regressed defensively somewhat, and has always been suspect as his game-calling. I look forward to seeing what Sisco can do, but I doubt he gets a call up in September. We may have to wait to see how he performs in Spring Training 2017. By then, Wieters may likely be gone. 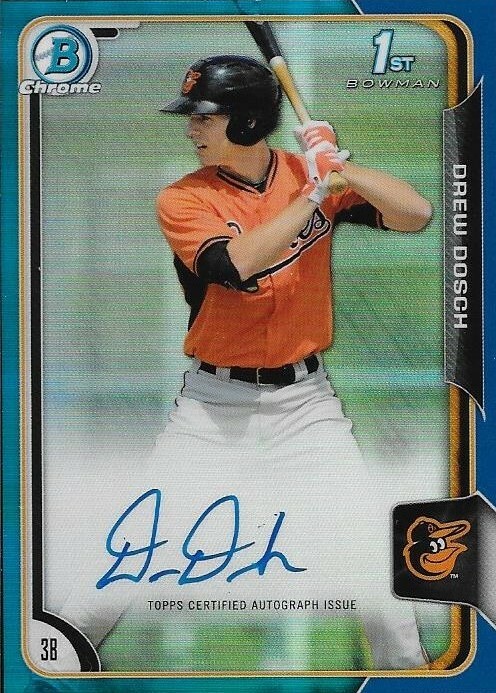 24 year-old Drew Dosch is batting .256 with an OBP of .306 at AA Bowie this season. He has 7 homers and has struck out 87 times. He was a 7th round pick in 2013 and hopefully will continue to move up in the O's system. He's a third baseman who has Manny Machado to look up at in the depth chart for a couple more seasons before Manny leaves via free agency. I got this card for less than $5 out of a bargain box. This 2015 Bowman Chrome blue refractor auto is numbered 28/150. I was excited to find this Cole Billingsley auto in a bargain box for $3.00. He is currently at Short Season (A) Aberdeen and is batting .283 with 3 homers over the course of 46 games. Not bad for his first season of pro ball. I look forward to following Billingsley's career as he rises through the ranks. Hopefully he will make the majors, which would be really cool for a kid featured on a 2010 Bowman card at the age of 16. 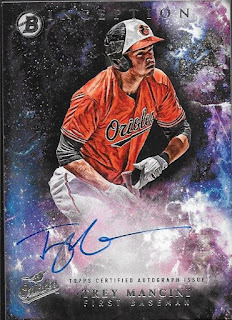 Finally, we have a 2016 Bowman Inception Trey Mancini auto that I picked up for less than $15. I love these cards. My buddy Robert busted two cases of Inception and actually pulled this same card. I wanted to get it from him, but he sold it before I had a chance to make an offer. Oh well. This card is not numbered, but the auto is on-card. 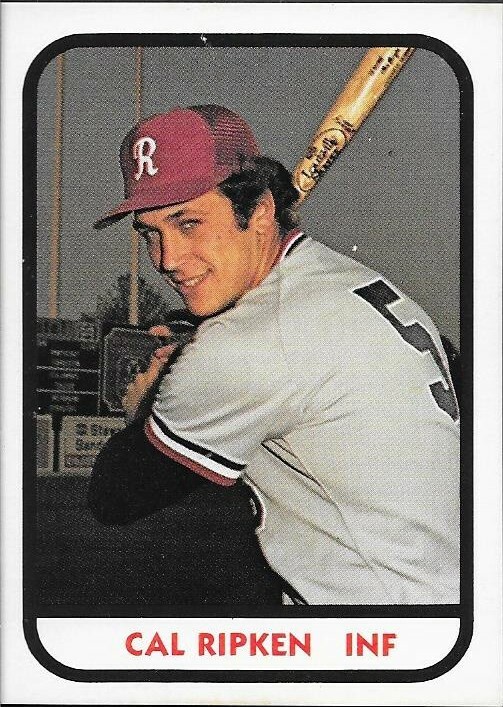 Mancini sports a .306 average across 4 minor league seasons. He was promoted to AAA Norfolk, a notoriously unfriendly park for hitters' stats, but has batted a respectable .279 with 13 home runs over 118 games. Mancini stands a chance to be called up when rosters expand on September 1. If anything, he must be added to the Orioles 40-man roster this off season, or they risk exposing him to the Rule V Draft (where any team can draft him for the price of $50,000, but must keep him on their 25-man roster, or offer him back to the O's for $25,000). It is a no-brainer that Mancini is added to the 40-man no later than the off season. I believe the last transaction I made at the National was pairing up a Joe Torre signed baseball with this Jim Thome ball for a great deal ($125, I believe). 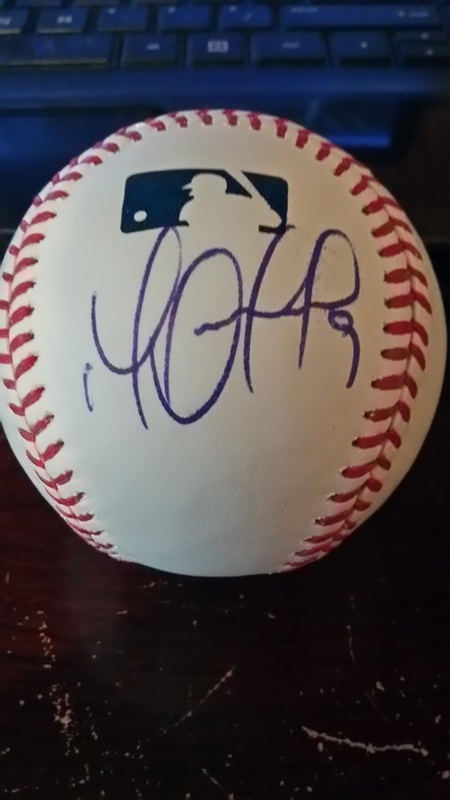 I had seen Thome balls at the show going for $125 alone, so, essentially, I got the Torre for free. I have wanted a Thome ball for some time now, especially since I was right beside him twice at Camden Yards (back when he played for the Twins), but couldn't get him to sign. I was running around the National during the final minutes of the show looking for a vendor who had cheap Vladimir Guerrero balls, but I found the guy with Torre and Thome instead. Adding the Hall of Famer (Torre) cheaply won out over Vladdy. Thome (b. 1970) played in the Majors from 1991 to 2012 for the Indians, Phillies, White Sox, Dodgers, Twins and Orioles. He was a 5-time All Star who finished as high as 4th in the NL MVP Voting (2003). He appeared in two World Series with the Indians (1995 and 1997), but never won a ring. 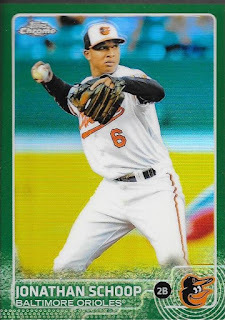 He retired after the 2012 season, one in which he was traded to the O's for the stretch run. 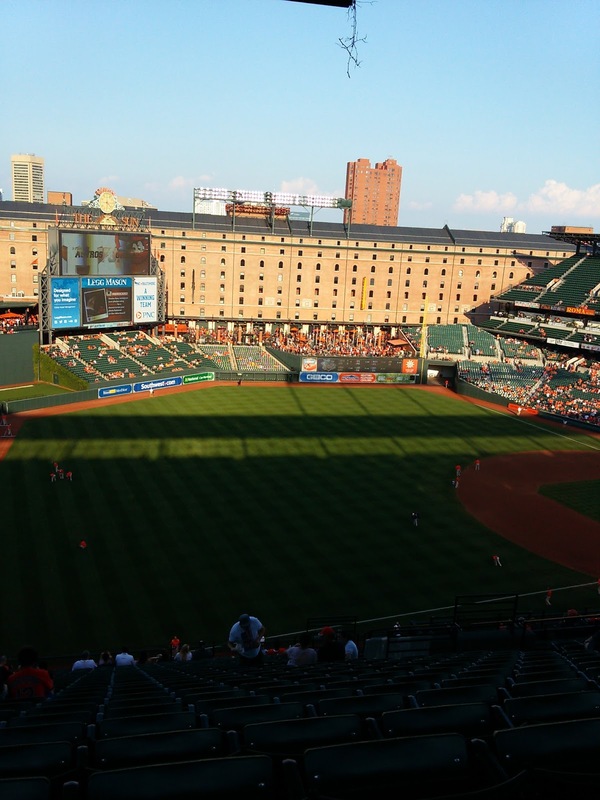 The 2012 Orioles would fall to the Yankees in the ALDS that year. Thome had 2,328 hits, 612 home runs and a .276 batting average. His home run total currently ranks 7th all time. He will be eligible for Hall of Fame voting in 2018. It seems that every year, the Orioles are able to find usable pieces in the December Rule V Draft. Ever since they were able to pick Ryan Flaherty up in the 2011 version, they have been active in the draft and have been able to keep the guys they have picked. They were able to stash T. J. McFarland and Jason Garcia on the roster and now they remain in the organization (although, McFarland was designated for assignment today to make room for the return of Tommy Hunter. 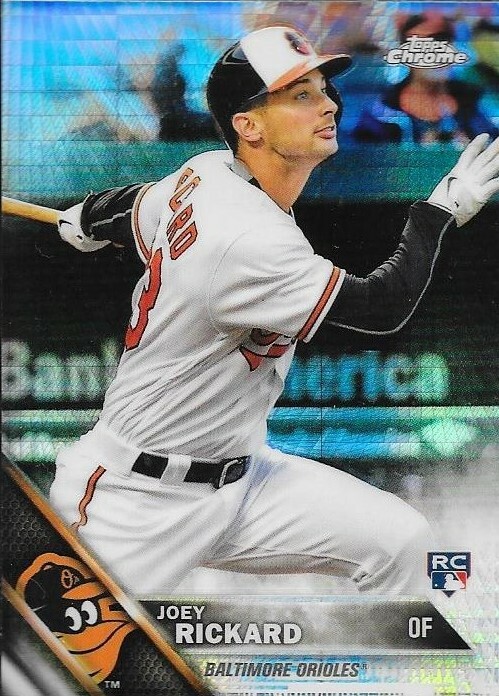 I didn't think too much this year when the Orioles added a Rays far hand to the roster via the draft, but based on his strong spring, Joey Rickard really raised some eyebrows. 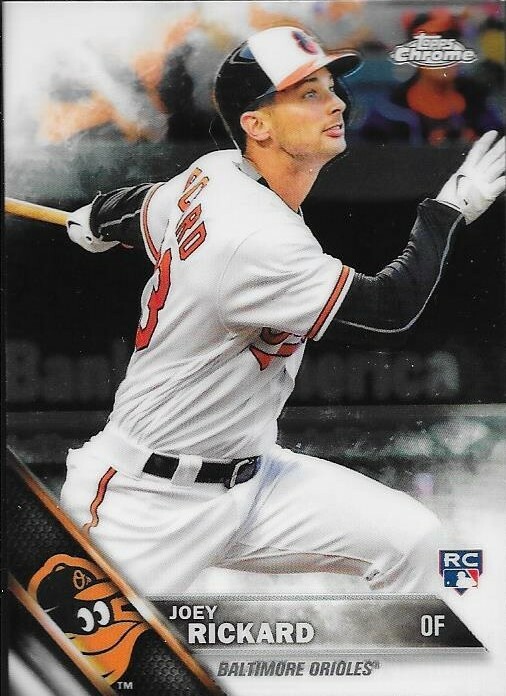 Rickard made the Orioles Opening Day roster out of Spring Training, and performed strongly over the early part of the season. He came back down to Earth, then was sidelined with a thumb injury that has put him out until mid-September. Rickard has already endeared himself to many O's fans. He's young (25), has some speed, and has been getting on base. Currently, he has a .268 batting average with 5 home runs over the course of 85 games. When he gets back to the active roster, I believe he will be an important table setter for a team that desperately is trying to make the playoffs. I picked up these Chrome cards at various vendors at the National. They are Rickard's first Topps offerings, and they look great. I got his auto at the top of the page for around $10, and the other two cards (his base chrome, and the prism refractor) were in dime boxes. It has been a while since I have gotten TTM successes on a regular basis, but some trickle in here and there. I think I have two others, aside from this one, that I still need to post. 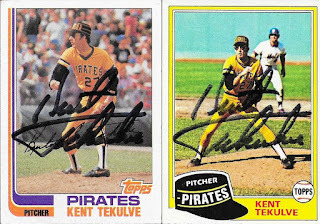 I mailed to Kent Tekulve on April 20 of this year, and got back three of the five cards that I sent. He kept the 1977 and 1983 Topps that I sent. No big deal. He signed the cards in sharpie, one that was about to give out, but the cards still turned out ok. The cards came back on August 8, for a 110-day TAT. 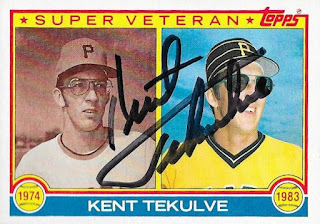 This 1983 Topps Super Veterans card might be my favorite of the bunch. I like being able to get some different types of cards signed TTM, and these are really nice ones to try to go for. Tekulve (b. 1947) played in the majors from 1974 to 1989 for the Pirates, Phillies and Reds. 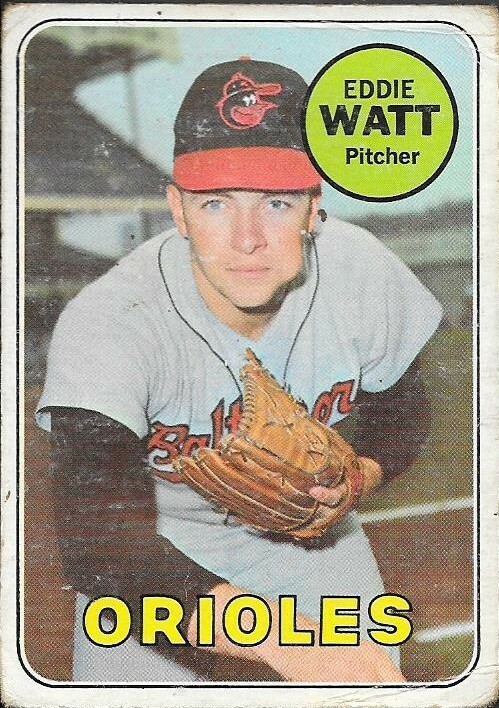 He had a career record of 94-90 with an ERA of 2.85, 779 strike outs and 184 saves. He finished as high as 5th in the NL Cy Young voting (twice, 1978 and 1979). 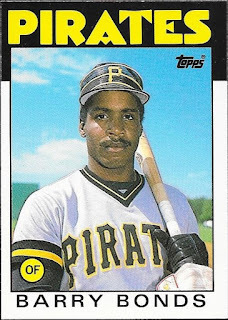 He also won the World Series with the Pirates in 1979. He appeared on the 1995 Hall of Fame ballot, yet only received 1.3% of the vote. A National Card Show wouldn't be complete without my picking up Jonathan Schoop cards dirt cheap. I have continued to take advantage of him being grossly underrated, which is fine, since I can get some really nice stuff of his. This year, I picked up some great parallels and a couple autos. The above green refractor from 2015 Topps Chrome is numbered 7/99 and came out of a dollar box. It was cheaper than a dollar because I got a bulk deal on it, so that made it even better. 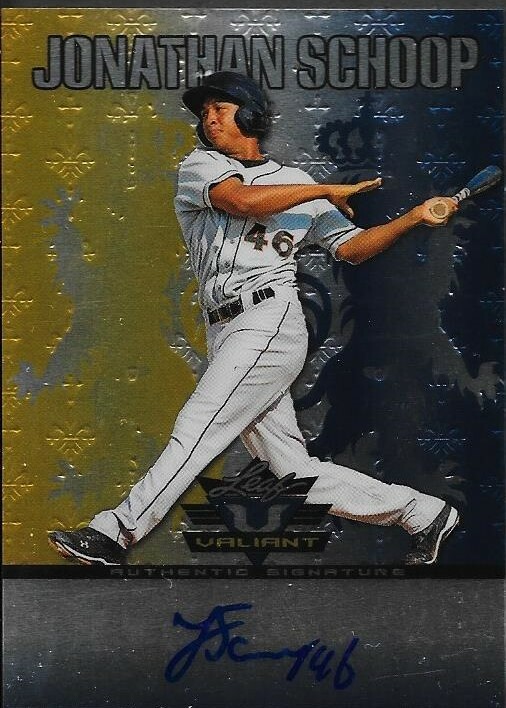 This 2011 Bowman Platinum blue parallel was also in a dollar box. Even worse, it was unsleeved, just floating around loose in the box. It is numbered 9/199 and now resides in a penny sleeve and top loader. 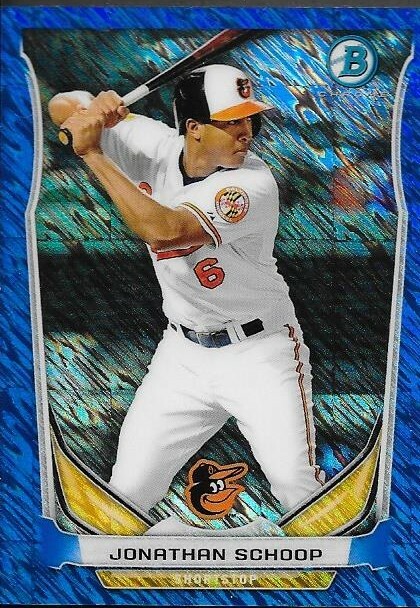 This 2014 Bowman Chrome Mini blue parallel is numbered 112/250. It was ALSO in a dollar box and was floating around loose. I don't remember what I paid for this 2011 Leaf Valiant Schoop auto, but I believe it was in a $5.00 box. Not too bad for a nice auto. 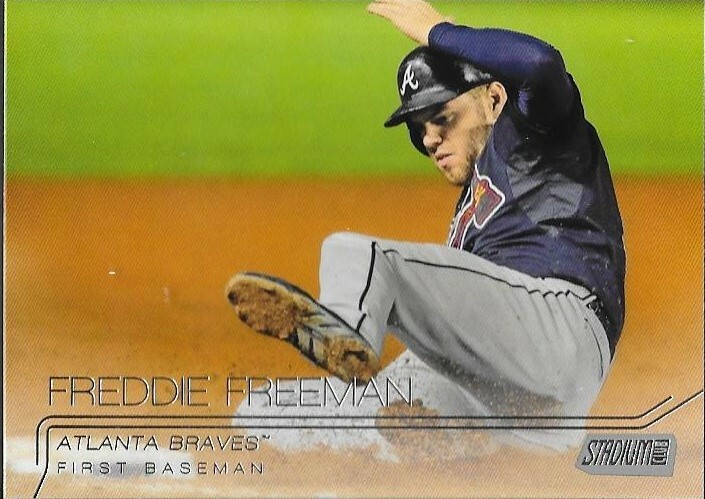 This is a cool-looking card that definitely looks better in person. It didn't scan all that well. Finally, here is a nice 2014 Tier One auto numbered 211/399 that was priced at $7.00, but I got cheaper since it, too, was part of a bulk deal. 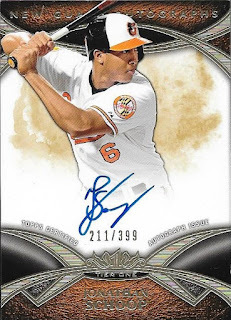 I need to sit down and count how many Schoop autos I have. I'm sure I have a bunch now. Schoop is having a great season for the Orioles. batting .282 with 20 homers through 127 games. 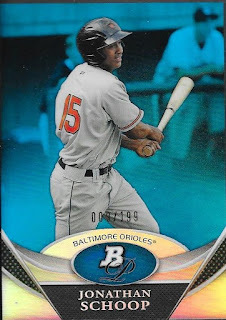 He has been a solid piece for the Orioles and could very well top out at more than 30 home runs this year. I believe Schoop will have a few big moments for the O's down the stretch. I spent a lot of time at the National with my good friend, Frankie. The National was in hit back yard, and he was a very gracious host to Andrew and I while we were there. 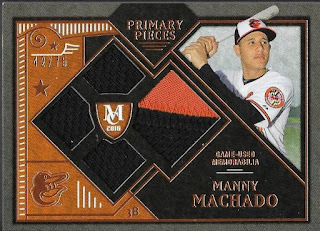 Early on at the show, Frankie surprised me with this awesome 2016 Museum Collection Manny Machaco quad relic. It has a nice piece of orange patch, as well. The card is numbered 42/75. I really appreciated Frankie hooking me up with this card. He didn't have to give it to me, but he did. 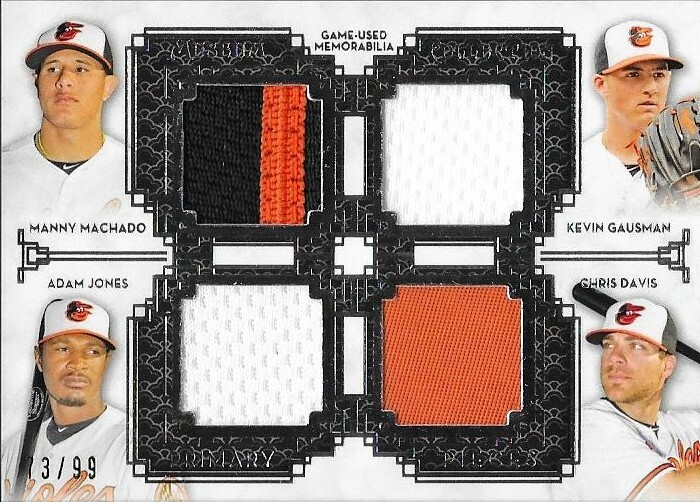 I love Museum Collection, and this Machado will look great in my collection! Thanks Frankie! Here's a little something different. During my trip to the National this year, I tried to find some good deals on cards in the dollar, 5 dollar, etc boxes. One box I looked through had a bunch of rookie cards from the mid-80s at severely reduced prices. I regret not picking up more of the rookies that I found, but one that I saw jumped right in my pile once I saw it. 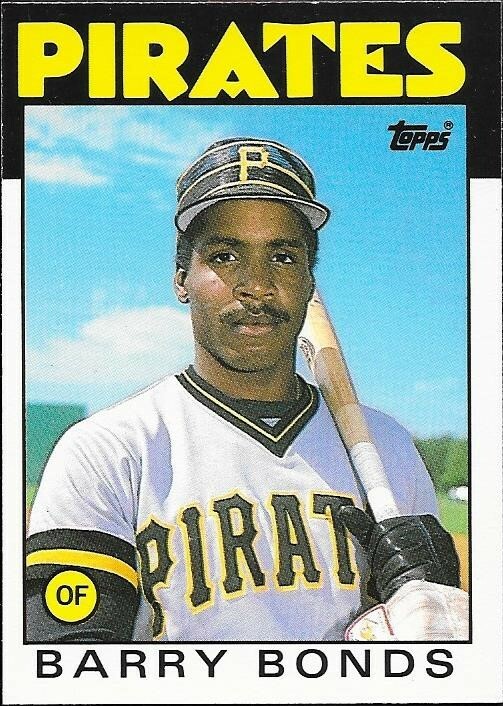 I have never owned this 1986 Topps Traded Barry Bonds, so I was really happy that I saw it for $3.00 at the show. 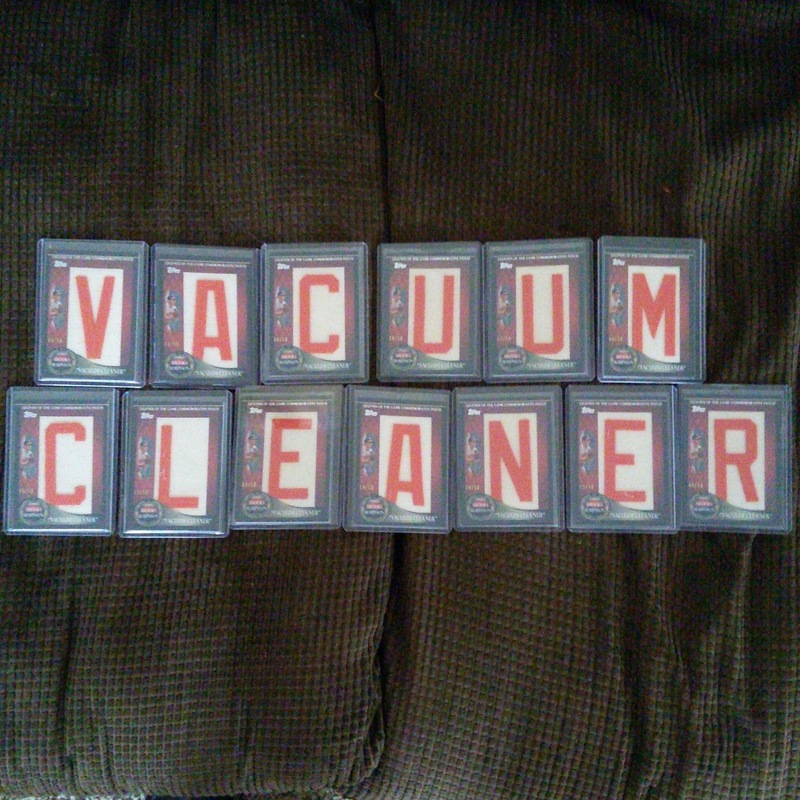 I bundled it with a stack of other cards, so I paid a lot less than $3.00. I really enjoy the 1986 set, and already had the Bo Jackson from 1986 Topps Traded. I will put this in a brand new top loader and store it with my other rookies. 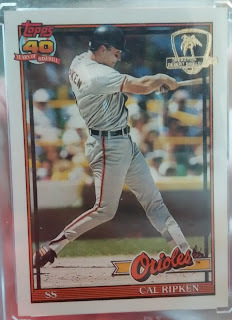 I know the card is nowhere near worth what it used to be back in the early 90s, but it is still cool that I got one of these for a good price. I still have a huge stack of cards from the show (not to mention several signed baseballs as well) that I need to post. I think National posts may very well get me through the season into the off-season, to where I can start up some TTMs again, among some other projects. I had hoped that when the Topps Now concept was coming about, I would end up with a few from this season that showed my favorite players and some awesome moments for the Orioles. 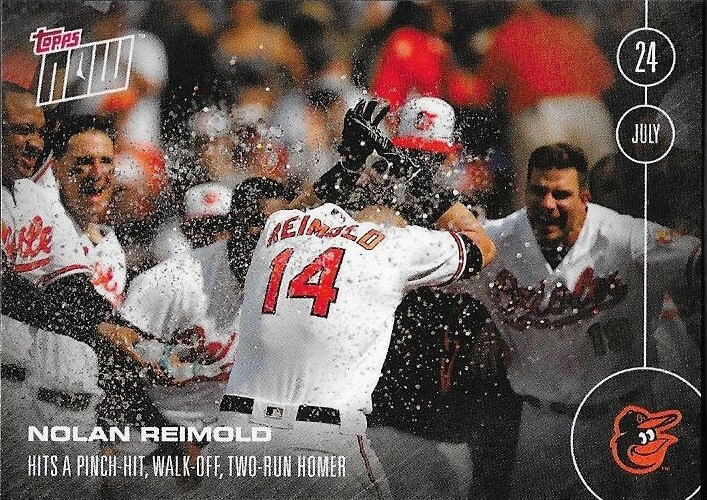 Well, I got my wish when Nolan Reimold cranked a walkoff home run on July 24. The O's were able to defeat the Indians, and Nolan was able to be the hero. I ordered the 5-card deal when they were announced the next day, and promptly messaged Nolan's wife, Jenny, about them. She had no idea that Topps was doing this, so I was glad to let her in on it. Unfortunately, she was busy the day they were available and forgot about them. Not to worry, though, I ordered the 5-pack for a reason. I made sure to send her one, when they finally arrived (after I got home from the National). Nolan has had a rough go as of late, but I'm thinking he will be able to turn it up for the stretch run. He is still a very good player and one that I definitely would love to see in a big at bat during the playoffs. He deserves it, after all that he has been through the last several years. I (obviously) still keep in touch with Jenny. She is always helping me out and is always adding to my Nolan PC. She also still reads this blog, when she finds the time. I will always appreciate the help she has given me, and I was more than happy to pick up one of the Topps Now cards for her. I was really happy with everything that I found at this year's National. Most every card I set out for, I was able to find. One thing I told myself was that if I saw any Museum Collection Orioles quads at the show, I would pick them up. I found one for $15 at a booth, and jumped all over it. This has Manny, Jonesey, Gausman and of course, Chris Davis. It has patches from Manny and Davis, and jersey swatches from Jones and Gausman. The card is numbered 73/99. Including the Davis quads, I have 10 quad cards from 2014 Museum Collection. I really love the set and will keep picking them up, as long as I see them at reasonable prices. 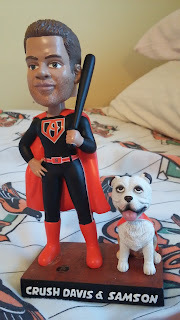 When I saw the ads for the Crush Davis and Samson bobble heads, I immediately knew I wanted to add it to my collection. Sure, I PC Davis, but I loved that the dog was also included, as well. Originally, I had contacted my friend, Michael, and asked if he thought he would be able to pick one up for me, but the more I thought about it, I decided to make a day-trip out of it. My son, Chris, had asked a few times if I would be able to take him to Baltimore before school starts back. Also, my older brother, Philip, had asked a few times if I would take him to a game sometime, as he had never been to an MLB game before. So, after a few text messages on Friday and making sure Philip could get here in time, we set out early Saturday morning to Baltimore. We ran into a ton of traffic on the way North. I think everyone had the same idea we had, take one last trip for the summer. Of course, that was in addition to DC traffic, which always is terrible. We finally got to Baltimore around 3PM, parked, then walked to the Lexington Market for some seafood at Fraidley's. Philip got a brioled salmon, Chris got fried oysters and I got an amazing crab cake. The food was awesome! 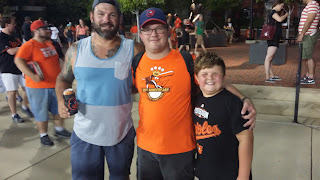 Before the game, I met up with a fellow Instagrammer, Jack, and showed he and Philip how to "graph". We got pretty close to Jose Altuve and Carlos Correa, but couldn't get them to sign for us. Philip, Chris and I each ended up getting Marwin Gonzalez on OMLBs, but Jack held out for someone else. We left the area before Jack got anyone, and I'm not sure if he did. The game itself was forgettable. 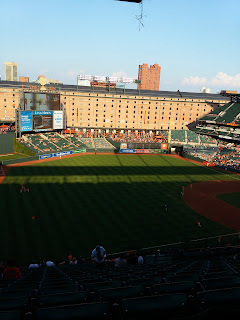 We got to see Chris Davis hit a homer, which was nice, but the rest of the game has been erased from my memory. Thanks, postage stamp-sized strike zone and crappy pitching! We did have fun at the game. Philip enjoyed himself, and it was nice to be able to spend time with him. We have gone on some trips together, before, like Summer Sanitarium 2000 and Philly this January, but we had never gone to a baseball game together. He loves to give me a lot of crap about the Os, feigning interest in the Yankees to get under my skin. He does it out of love, though. He is really knowledgeable about sports and is always ready for a good debate. He also helps plug the blog whenever he gets a chance, which is very helpful. Here is the Marwin Gonzalez auto that I got. It turned out pretty well, and he was very nice to us. I was hoping for Altuve, but I'm happy with what I got. Overall, I had a great time with my brother and my son! I also met up with a couple friends and got a cool bobble head. What more could you ask for? Oh yeah, a win would have been nice. Oh well. While I was looking for the 2001 Topps Chrome Albert Pujols rookie, I stumbled upon a card I needed, but hadn't really thought about picking up. One of the vendors who I had asked about the Pujols had this Ichiro RC for $20, and I grabbed it up. I already had his base RC, but not the chrome. That put this card low on my priority list, but I figured at that price, and with Ichiro about to break the 3,000 hit barrier, I went ahead and picked it up. I'm glad I did. 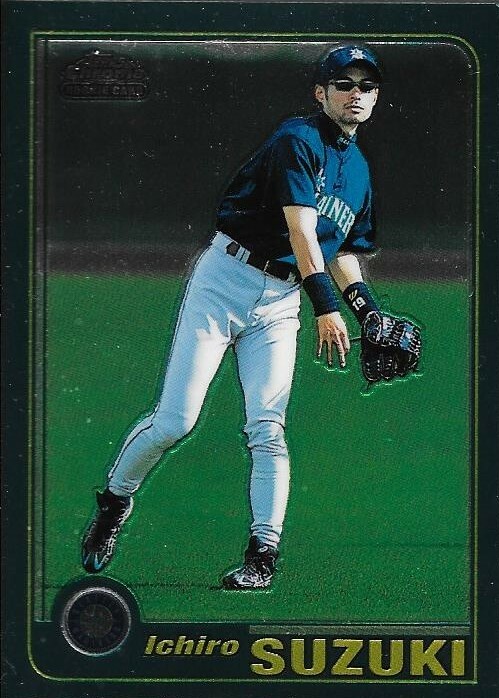 Ichiro has now passed 3,000 hits and should be a first ballot Hall of Famer. 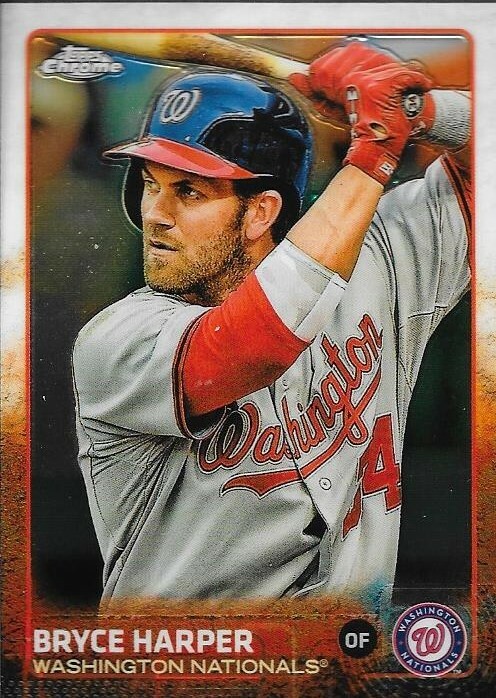 I now have his 2001 Topps and 2001 Topps Chrome, which it nice. I need to think long and hard about the next rookie cards that I want, because I have so many now, it is hard to think of what I need. 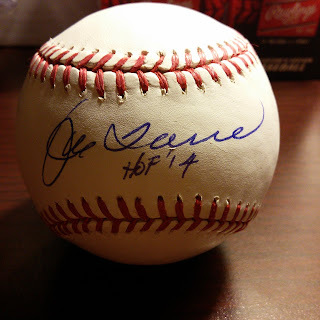 I picked up one more Hall of Fame signed baseball while at the National Card Show in this Joe Torre. I got a great deal on this ball when I bundled it with another ball that I will show in a later post (a future Hall of Famer). Torre (b. 1940) played in the majors from 1960 to 1977 for the Braves (Milwaukee and Atlanta), Cardinals and Mets. He had 2,342 hits, 252 home runs and a .297 lifetime batting average. He was the 1971 NL MVP when he had 230 hits, 137 RBIs and an NL leading .363 batting average. He was also a 9-time All Star. As a player, Torre appeared on fifteen BBWAA Hall of Fame ballots (1983 to 1997), but could only gain as high as 22.2% of the vote (on his final ballot). As a manager, however, is how Torre really gained election to the Hall. He managed in the majors from 1977 to 1981 with the Mets, 1982 to 1984 with the Braves, 190 to 1995 with the Cardinals, 1996 to 2007 with the Yankees and 2008 to 2010 with the Dodgers. Prior to his time with the Yankees, Torre was a fairly middling manager. He had some success with the Braves, reaching the playoffs, but losing in the NLCS 3-0 to the Cardinals. Torre took over the Yankees in 1996 and went on to win 4 World Series titles (1996, 1998, 1999 and 2000). His career managerial record is 2,326-1997 (.538 win percentage). Torre was elected to the Hall of Fame in 2014 by the Veterans Committee and is my 127th Hall of Famer. I have been waiting for seven years to write this blog post. When 2009 Topps Series 2 came out, the one and only Pete from Dropped Third Strike suggested that I try to complete the series. On June 13, 2009, I posted that I picked up two Us and an N. Pete had a C that he ended up sending to me. So, it actually took me seven years and two months to complete the series. By my calculations, since each card is numbered to 50, and you need two of the Us, two As and two Cs, only 25 of these sets can be completed. So, essentially, this set is a 1/25. I am pretty proud that I have finally finished it. I looked a three different National Card Shows to complete the series, with no luck at all. 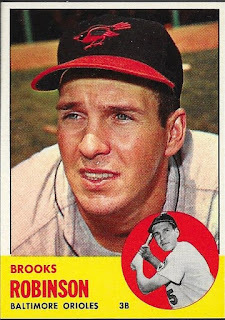 The closest I came was this year, when I found a vendor with maybe 15 of the letters from various series, but the only Brooks he had was the C. I thought I was smart back in the day when I added the search on Ebay as a "followed" search, only to be teased by the occasional L or E. Finally, last week, the followed search paid off when someone listed several of the letters at once. I had been waiting so long to finish this set, I was willing to pay almost any price to complete it. Luckily, when I saw the R go up for sale, it was $10.00 BIN with free shipping. So, I got it for a lot cheaper than most of the letters, which I paid between $15-$25 per letter (a couple were as low as $7, I think). So, I can now turn off the Ebay notifications. I can now stop searching through manufactured patches at card shows. I am officially taken out of the market for these letter patches. The original post that started this project can be seen HERE. When the signer list for this year's National came out, I wanted to get as many Hall of Famers that I needed for the collection as I could. After looking at the prices, I decided that I probably ought to stick with maybe only one, instead. You know, since Pedro, Piazza, et al, all went for north of $100 each. Biggio was really nice, in the brief moment that Andrew and I talked to him. I am disappointed to note that the photo I took of Andrew and Biggio turned out blurry as crap (thanks cell phone camera). Sorry, Andrew. Biggio (b. 1965) played in the majors from 1988 to 2007 with the Astros. He had 3,060 hits, 291 home runs and a .281 career batting average. He was a 7-time All Star and won the Silver Slugger award 5 times. He was also a 4-time Gold Glove Award winner. He finished as high as 4th in the MVP voting (1997). Biggio was elected to the Hall of Fame in 2015 on his third ballot when he received 82.7% of the vote. He is my 126th Hall of Famer. This card could have made it onto my Top Ten Wishlist for next year, had I not found it at the National. 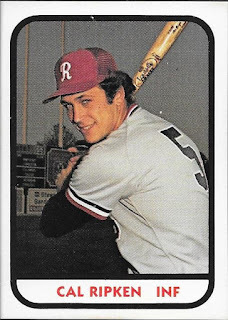 This is a 1981 TCMA Cal Ripken minor league card. I had looked at a few on Ebay a few weeks prior to the show and realized that they could be had for decent prices. I found one vendor at the show who had one, and picked this up for what I had seen them selling for. 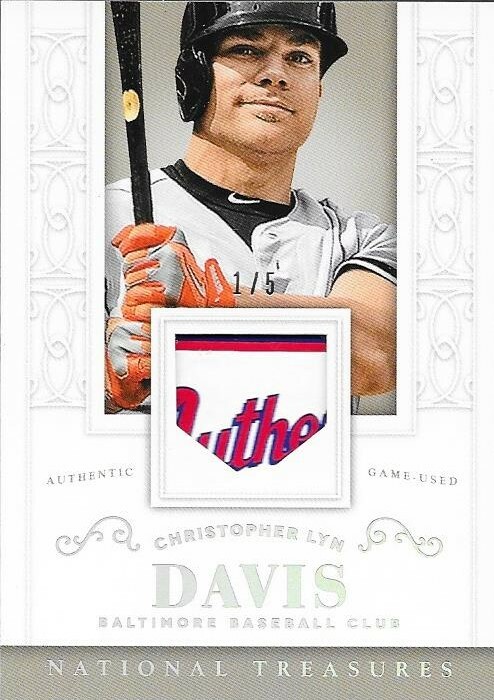 This is a pretty tough Cal to find, and I am glad I was able to add it to the Cal PC. I often complain about how hard it is to find Cal cards that I don't yet have, and this one was a prime example of one I really needed. 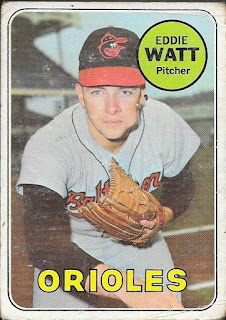 There is also the 1980 WBTV Charlotte Orioles minor league card, but I will never own that one. I saw one graded at a 7 at the show, and the vendor wanted $10,000 for it. No thanks! Maybe I will be able to find a generous benefactor who has the Charlotte O's Cal card, but I highly doubt it. Anyway, I am really glad I was able to knock off two big Ripken cards while I was at the National. Maybe if I think hard enough, I will be able to come up with some other Cals that can populate my Top Ten Wishlist for next year! I spent the entire 2015 National Card Show looking for this card, and I spent MOST of the 2016 show looking for it as well, but I finally found it! 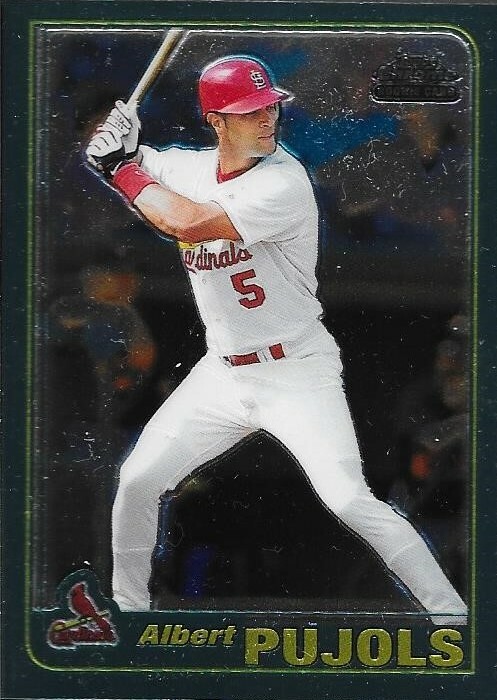 I finally have the 2001 Topps Chrome Albert Pujols rookie in my collection. I was walking around the show on the last day and was looking down quickly at the showcases when I saw it. I had walked around the entire show the whole time asking people if they had it and had come up short. 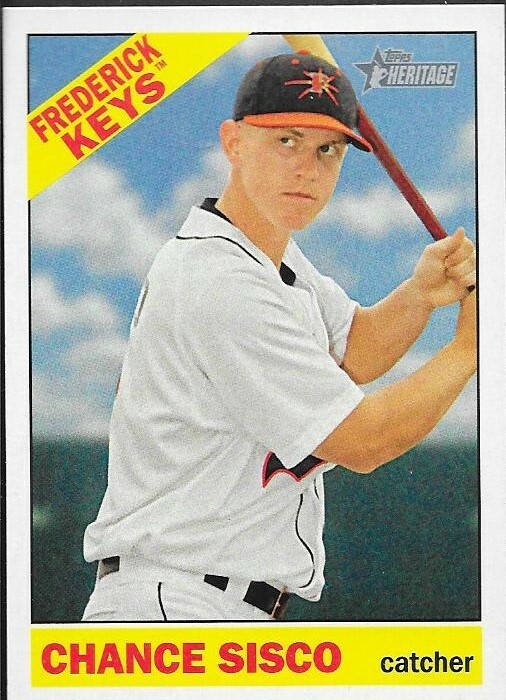 So much so, I ended up buying another big rookie from that series just because the dealer had it over the Pujols. I got it for a really nice price ($20) and am so glad I can take it off of my Top Ten Wishlist. I'm really going to struggle finding new cards to search for once the year is out. I definitely have met my goal in the amount of cards that I wanted to cross off of it (more to come in a few days on that). I believe I mentioned earlier that there were three signatures on my Jimmie Foxx baseball. 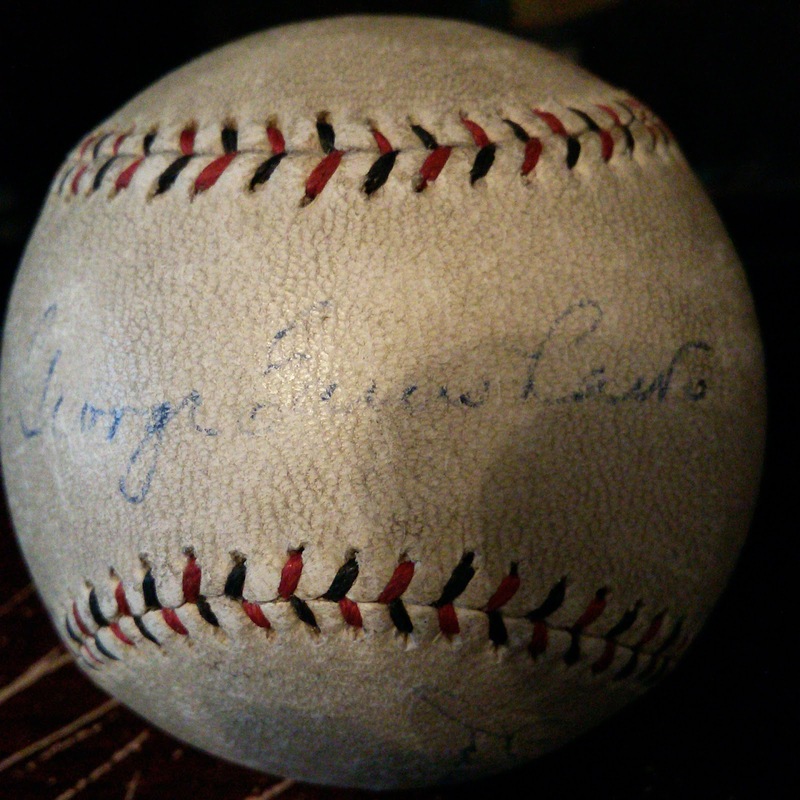 Along with Hall of Famers Foxx and Al Simmons, George Earnshaw's signature graces the sweet spot of the baseball. Earnshaw (b. 1900 - d. 1976) played in the majors from 1928 to 1936 for the A's (Philadelphia), White Sox, Dodgers and Cardinals. He had a career record of 127-93 with an ERA of 4.38 and 1,002 strike outs. He was a 20-game winner 3 times in his career. He led the AL in wins in 1929 with 24. He won the World Series with the A's in 1929 and 1930. 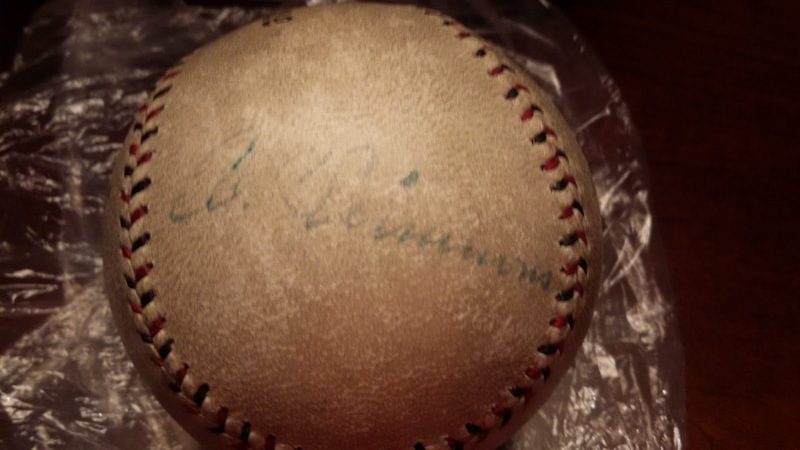 If this baseball was signed while the players were still active, that might put is an era from 1928 to 1933 since by 1928, all three players were on the A's, until Simmons left in 1933. It would be really cool if it was from that time period. It has to be from at least 1956, since that is the year that Simmons passed away. 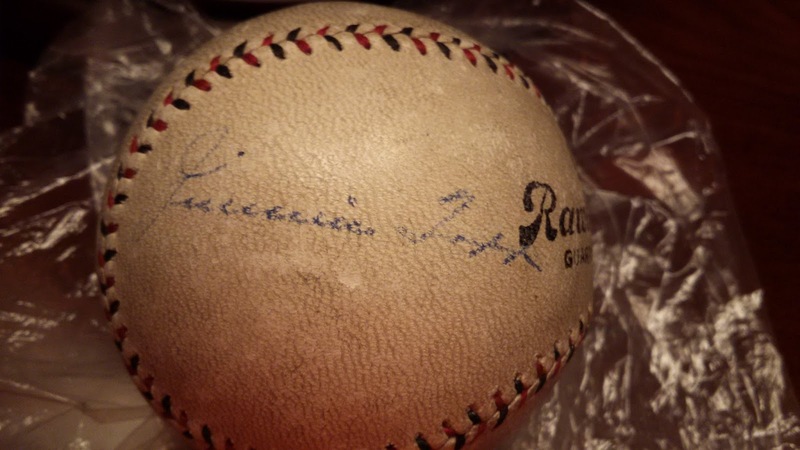 Regardless, I have an amazing baseball, and piece of history on my hands. I met up with one of my friends from Instagram the Saturday of the National Card Show and finally was able to pry a card off of him that I have wanted for a while. 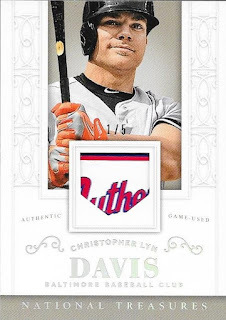 He had this Chris Davis 2014 Panini National Treasures laundry tag relic numbered 1/5 available, and I picked it up for a good price. I already had the 3/5 piece, so now I have two of the five pieces for this series (40%, haha). Not bad! I got it off of my friend, Robert L., who also works for the Aberdeen Ironbirds. Not a bad gig. He's a good guy that I am able to chat with at times, and he updates me on happenings at the Orioles Low A team. Thanks for the deal on this awesome card, Robert! I am happy to have it in the Davis PC. I'm kind of bouncing around with my posts about the National card show, but I wanted to get this card on the blog and off of my desk. Not because it is in the way or I am tired of looking at it. No, I want to put it away safely until next year's show because I believe I will take this to PSA for grading. The card is virtually flawless in my mind. Usually when I see vintage cards like this, they have surface wear, or a dinged corner. There are no slight creases or wrinkles on this card. The surface gloss is still there, even 53 years after the fact. This really is a sharp card. To say I was disappointed when I first got the card is an understatement. I was happy to complete a deal, but I felt like I messed up big time prior to the deal, but in the end, I am glad I sat down and really looked closely at the card. I had met up in person with my good friends Kyle and Jordan at the show. Both of them are guys I have befriended on Instagram right at the beginning of my time there. Kyle was the first successful deal that I made, and Jordan is his best friend. We all hit it off and have been good friends ever since. Kyle was interested in a Brendan Rogers card that I had, and offered up the Brooks. I had gotten the Rogers when my friend, Robert, traded my 2016 Bowman Rogers auto that we had raw card graded at Beckett. It got a 9-10, and I let Robert trade it for me, since he was flipping his graded stuff for crazy deals. He flipped that Rogers for a... Brendan Rogers auto. 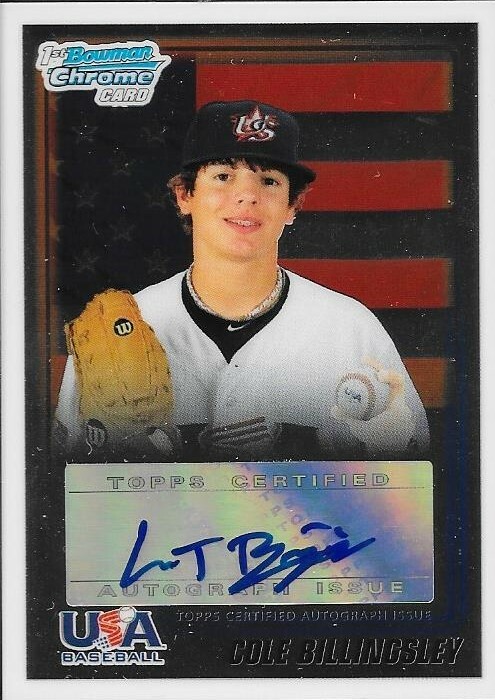 This one was a 2015 Bowman's Best RC auto. 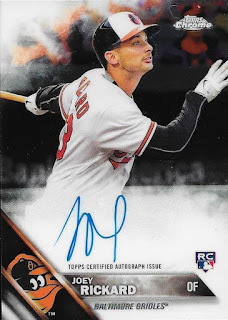 Robert felt like he got a good deal, and I couldn't blame him, since it was a RC auto, but I had been hoping for something better, like an Oriole. So, Kyle said he was interested in the Rogers and offered the Brooks. Since it was a Brooks, and since Kyle is such a good friend, I had to let him have the deal. 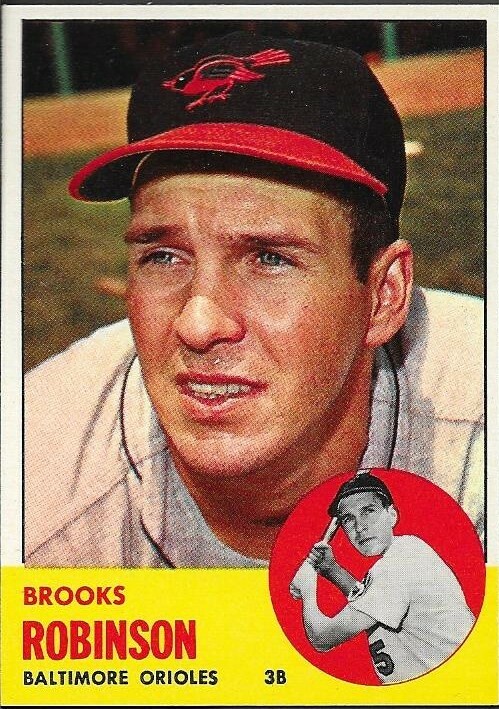 I felt like he got the better end of the deal, since I already had a 63 Brooks. I took the card, put it in my box and forgot about it until Andrew and I were looking at cards a few days later. I noticed, then, that the Brooks that Kyle had traded to me was in such amazing shape. I had spent a good deal of time at the show shopping around for a graded vintage card for a friend and came to realize just how tough it is to get a high grade on vintage. I also learned about the huge difference in quality and price between grades. A 6 goes for a fraction of a 7 which goes for a fraction of an 8. I think this card would bring a pretty high grade, even with its centering. So, all of that being said, thank you so much for the trade, Kyle. Also, thanks for sticking with me all of these years. It was great to finally meet you in person and even better walking around the show for a bit with you and Jordan and talking about cards. I didn't have a lot of time for box searching at the National like I had hoped, but I did get a few cards to help with some sets I have been working on. I was disappointed that no sellers seemed to have any 2015 Stadium Club cards, but I knocked out 5 1969 Topps cards for the set, all big names. 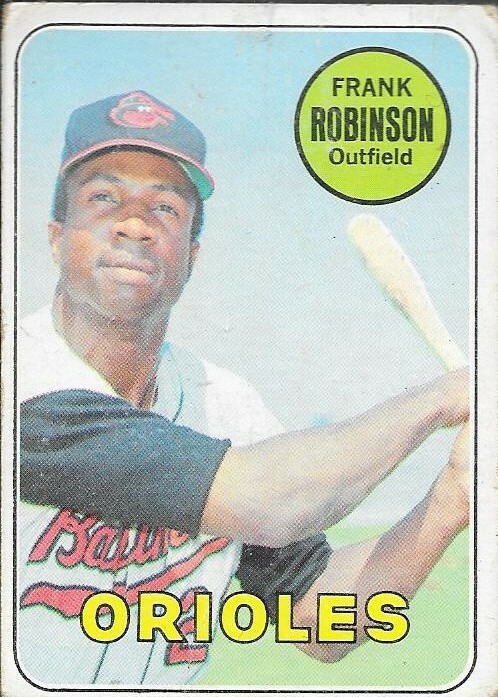 The above Frank Robinson was actually on my Top Ten Wishlist, so I was able to cross a card off of that as well. The other guys I got were Red Schoendienst, Ron Santo, Gaylord Perry and Jim Kaat. We also walked into the show with Frank Robinson on Friday. That was really cool. 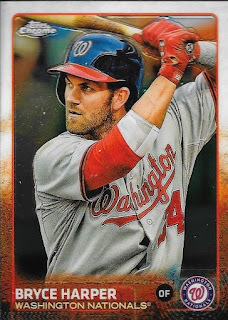 I also knocked off all of the 2015 Topps Chrome cards that I needed, except for four short prints. I need to get those from Ebay, I guess. I nabbed 28 cards that I needed. I wish I had been able to finish the whole set, but oh well, I'm really close. I'll probably hit Sportlots and Ebay to finish Chrome and Stadium Club. The National Card Show afforded me an opportunity to add five Hall of Famers to my baseball collection, and a couple others who should be enshrined sooner, rather than later. For a good deal on Saturday, I added Barry Larkin as my 125th Hall of Famer. The ball is JSA authenticated and is a William White ONL baseball. The dealer gave me $5 off the price, which is decent enough, I guess. I have been wanting to knock Larkin off of my list for some time now, even though, in my humble opinion, I don't feel as if he is a surefire Hall of Famer. That being said, however, there are guys who aren't in that I believe should be, but others could have an argument against them. It creates a good field for debate, though. Larkin (b. 1964) played in the majors from 1986 to 2004 for the Cincinnati Reds. He had 2,340 hits, 198 home runs and a career average of .295. He was an All Star 12 times, won the NL MVP in 1995 and won the World Series in 1990 with the Reds. He was also a 9-time Silver Slugger Award winner and a 3-time Gold Glove Award winner. Larkin making the Hall of Fame as a shortstop, I guess paves the way for someone like Omar Vizquel to get in. I just don't feel as if Larkin has the stats, but compared to other shortstops not named Cal, he probably does measure up. 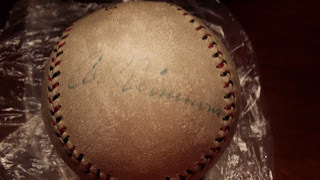 Not to be lost with the excitement of Jimmie Foxx, there was another Hall of Famer on my ball that I purchased at the National. Al Simmons is one of those players from that era that is known only to die hard baseball fans. Yet, he is a Hall of Famer, and a very tough one to get on a baseball. Simmons (b. 1902 - d. 1956) played in the majors from 1924 to 1941, 1943 and 1944 for the A's (Philadelphia), White Sox, Tigers, Senators, Braves (Boston), Reds and Red Sox. He had 2,927 hits, 307 home runs and a .334 batting average. He finished as high as 2nd in the MVP voting (1925, losing to Roger Peckinpaugh). Peckinpaugh's stats do not even begin to compare to Simmons's, let alone other players during that season (Babe Ruth..???). That version of the MVP award was voted on by an 8-member committee and was dropped after 1928. Simmons had a great career; he is the fastest player to ever record 2,000 hits (in 1,390 games). He is ranked 23rd all-time in batting average with .334. He was a three-time All Star (1933, 1934 and 1935) and won the World Series twice with the A's (1929 and 1930). He had 200 or more hits six times. He was the AL batting champion in 1930 and 1931 (.381 and .390, respectively). He batted over .300 and had 100+ RBI in his first eleven seasons. Simmons was elected to the Hall of Fame in 1953 with 75.4% of the vote (his seventh official ballot). 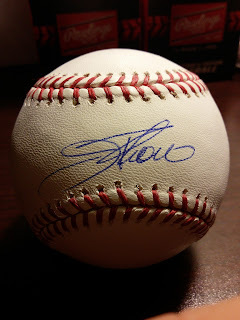 Simmons is my 124th Hall of Fame autograph. I finally was able to add the Hall of Fame baseball that I have coveted the most. I got Jimmie Foxx. A full JSA LOA included from a very reputable dealer, I am so excited to announce this as my 123rd Hall of Famer. I came to the National this year with a plan in mind if I found a Foxx that I liked at a reasonable price. I also enjoyed chatting with the seller of the ball. We spoke for a while about Hall of Famers, about my meeting with Mr. Don McNair, who's dad played alongside Foxx, and collecting in general. I made up my mind to purchase the ball, but saw that it had no LOA to go with it, so the seller took it to JSA and had them issue an LOA, all of this he did for free. I made the purchase yesterday, and picked the ball up around lunchtime today, once the LOA was completed. I had a good laugh with the seller this morning. He asked me to come sit by him while one of his staff went to check on the LOA. I had asked him if he was having a a good show, to which he replied: "Oh man, I killed it yesterday. I found some sucker to buy this Jimmie Foxx ball off of me. I killed it!" Then he slapped me on the shoulder and we had a good laugh together. I really enjoyed buying from him, Kevin Keating, and definitely will again. I was really nervous about the purchase, but he made it really easy on me. He even gave me a bit of a break on the price. It is a huge purchase, but I see it as an investment. Foxx obviously isn't signing anymore, and I have wanted one for years. Now I have one, and couldn't be happier. Foxx (b. 1907 - d. 1967) played in the majors from 1925 to 1942, 1944 and 1945 for the A's (Philadelphia), Red Sox, Cubs and Phillies. He retired with 2,646 hits, 534 home runs and a .325 batting average. He was a three-time AL MVP (1932, 1933 and 1938), two-time batting champion (1933 - .356 and 1938 - .349), and four-time home run champ (1932 - 58; 1933 - 48; 1935 - 36 and 1939 - 35). Foxx hit 50 or more home runs twice, 40 or more home runs 5 times and 30 or more home runs 12 times (and in 12 straight seasons). He was an All Star 9 times from 1933 to 1941. Foxx won the World series twice with Connie Mack's A's, in 1929 and 1930. Foxx was elected to the Hall of Fame in 1951 by the BBWAA with 79.2% of the vote (really?). He had appeared on 8 ballots, back when the voting was far different than it is today. Foxx is, without a doubt, an All-Time Great. He ranks 15th all-time with a 4.21 career share MVP vote, 10th all-time with a .428 OBP, 18th all-time in home runs (534) and 9th all-time in RBI (1,922). When he retired, Foxx was second all-time in home runs. Someone had to come in second to Babe Ruth. I'm wore out from another day at the National Card Show. Today was the first full day, and I was able to add a good bit of stuff to the collection. One of my Top Ten Wishlist items was crossed off of the list today in this 1991 Topps Desert Shield card. I had asked a couple dealers as the day went on to see if any were available, but didn't have much luck. I ended up picking up a few inserts and parallels as I walked around the show. I stopped at one dealer about halfway through the day and asked him if he had one, he laughed, and said he thought he did, but wasn't sure if he could put his hands on it. Luckily, he was able to find it in one of his boxes! I'm glad I asked about it! So, for $100.00, I was able to pick this card up. If you don't know about them, the Desert Shield cards were issued by Topps to servicemen and women in Iraq during Operation Desert Shield. Not many of the cards made their way back stateside after the conflict, so these are very rare cards. The Cal Ripken, Nolan Ryan and the Chipper Jones RC are all the most sought-after cards in the set. I'm really happy I was able to get this card and cross it off of the list! A new National Card Show is upon us, and I was able to make my first purchase well into the Wednesday Sneak Peek. I had spent a good bulk of the first day of the show waiting in line for one of the free signers, so I was really anxious when I had only one hour to really look around. 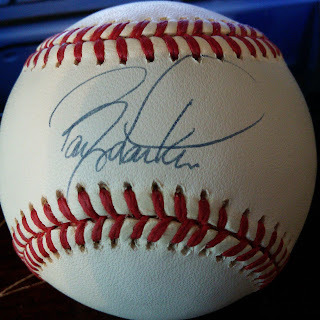 I found a dealer with a few signed baseballs, and noticed an auto that I have been needing in my collection for a long time. 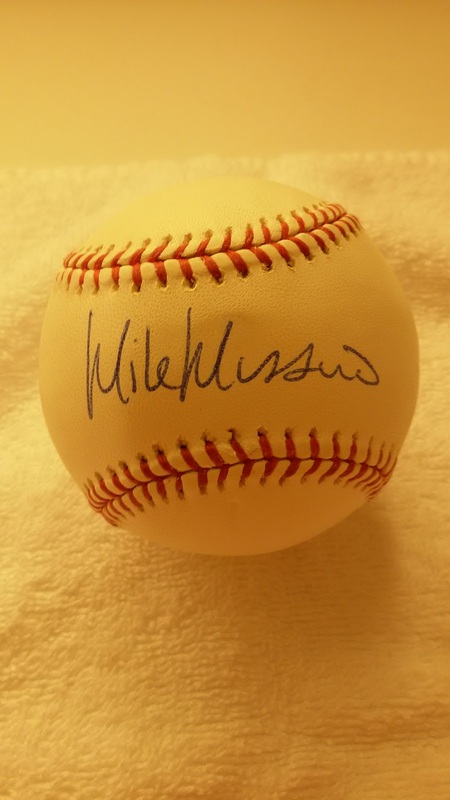 I got this Mike Mussina auto for only $20, since the seller didn't have any authentication to go with it. I know Moose's auto pretty well and am confident that this is a legit ball. 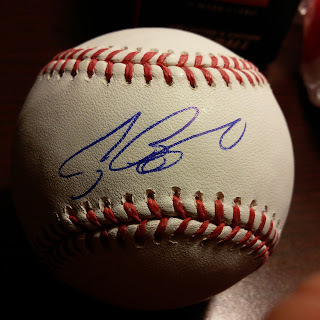 I have been wanting to get a ball signed by him for a while, and finally was able to get a great deal! Mussina (b. 1968) played in the majors from 1991 to 2008 for the Orioles and Yankees. He had a career record of 270-153 with an ERA of 3.68 and 2,813 strike outs. He never won a World Series or Cy Young Award, which are probably the reasons he isn't in the Hall of Fame... yet. He was a 5-time All Star and a 7-time Gold Glove Award winner. He finished as high as second in the AL Cy Young Award voting (1999 to Pedro Martinez) and as high as 19th in the AL MVP voting. I finally have a Mussina ball, and I didn't need to spend a ton on it the first day of the National. I'm really excited to see how the rest of the days go! I got a care package in the mail the other day from blog reader, Mark M. who had a few 1969 Topps and 2015 Stadium Club for my sets. Mark had commented on one of my Stadium Club posts recently, and was able to help me knock a few cards out of each want list. Mark sent along 10 1969 Topps that I needed. The cards were in decent enough shape for me to be able to cross them off of the list, just in time for the National. I doubt I will pursue completing this set while at the show. Completing the 1959 set last year was an expensive endeavor. I may grab a few, though, enough to make a dent, I think. Mark sent me three 2015 Stadium Club cards to cross off. I do intend to finish this at the show. I really want to put it behind me and move on to a more recent set. I am excited to complete this one, since it is in an album. I already enjoy flipping through it and looking at all of the photography. Thank you so much for the cards, Mark!